I know what you’re thinking—I’ve converted the blog over to poetry as an April Fools’ Day joke. But you’d be wrong. 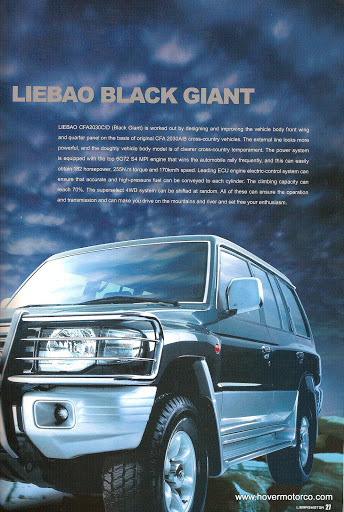 In fact, that beautiful quote was taken word-for-word from a recent Chinese car brochure. There are usually a few Chinese auto manufacturers that set up hasty displays at the North American International Auto Show in Detroit each year. And to catch the attention of the demanding journalists in attendance, they hand out brochures that look to have been converted from Chinese to English in some sort of computerized translator. I have to admit, I find these things irresistible. It just blows my mind that someone actually allowed this stuff to get into print. I mean, they had to spend a great deal of the company’s money to print up these glossy, four-color brochures, so why couldn’t they have e-mailed them to, say, a person who speaks English, for a little quick editing? And as classy as the brochures are, you have to experience these cars to really appreciate them. It’s no wonder that Buicks are regarded like Rolls Royces in China. Every one of these Chinese cars that I’ve had the chance to see or sit in has been, well, not so good. They’re like Hyundais from about 1989, but maybe not that nice. 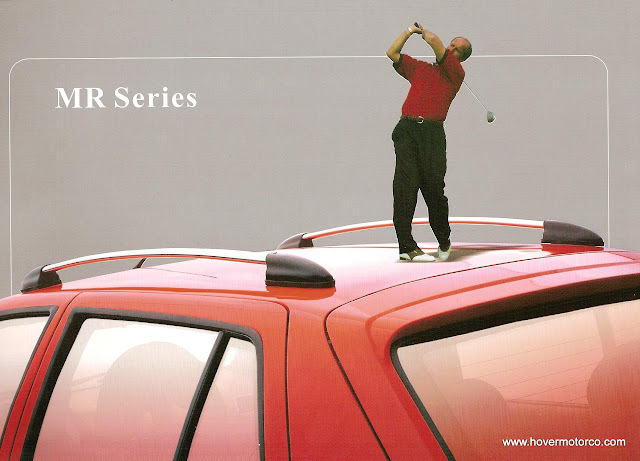 Thin, clangy sheet metal surrounds some of the most horrendous plastic interiors ever conceived. Just the toxic fumes from the fake leather and glue could maybe kill you before you get there, and features like a single airbag are listed as options. Of course, if you’re used to riding a motor scooter or a buckboard or something, one of these cars might not be so bad. There really weren’t many cars in China just a few years ago, and now it is considered the hottest automotive market on the planet. Even the stinky little cars their domestic manufacturers are churning out are a pretty big deal. 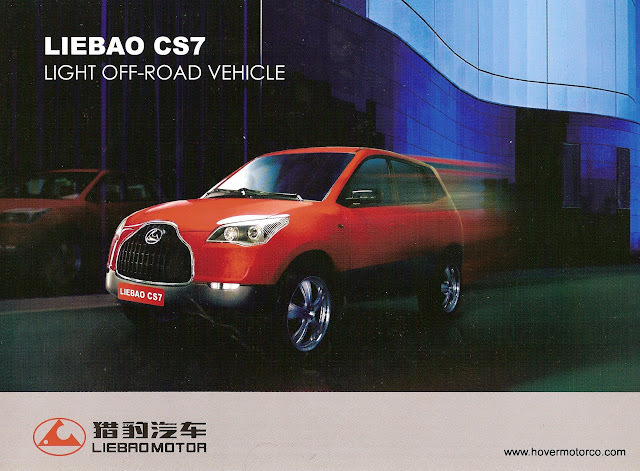 Still, even though the automotive revolution in China is as important as it is, it isn’t going to stop us from having a laugh at the expense of Chinese car literature. 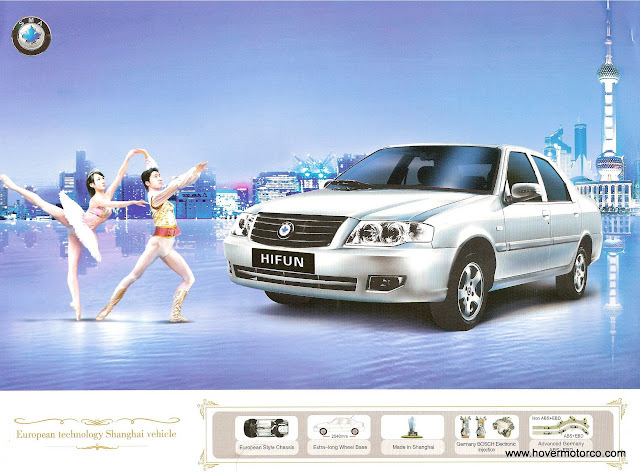 The slideshow below has several scans from Chinese brochures that you might find interesting. If you want to see them bigger, click on the middle of the slideshow, and it will take you to the Hover Motor Co. Picasa album. From there, click “Full Screen” in the upper left, and you should be able to read the text and captions.